I met Katie and Devin a few years ago through the wedding industry (they own DeGroot Film Co. - a photography and videography business). Since then we have worked together on many weddings and styled shoots. We have also teamed up to offer giveaways including The Whimsical Wedding Giveaway. We have always enjoyed working together and have become good friends over the years. So I was thrilled when they asked me to be a part of their destination wedding in Estes Park, Colorado. 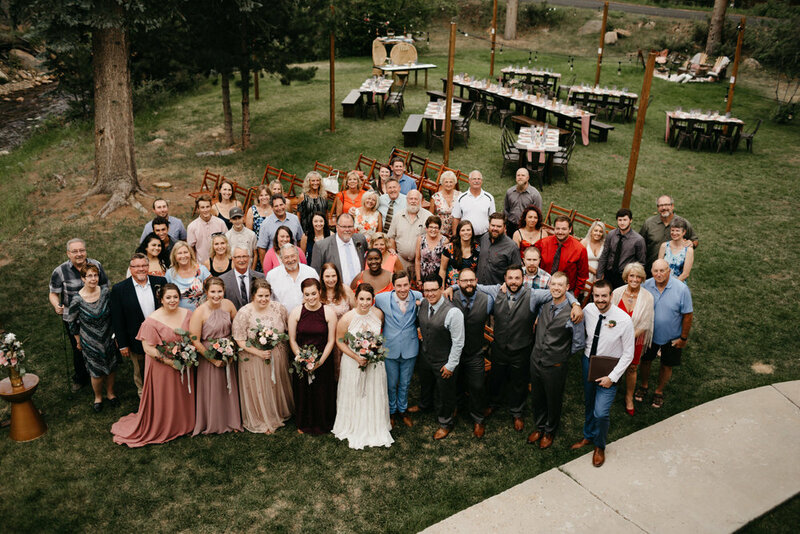 One of the things I loved the most is that the entire wedding was outdoors (something I never get to experience in Wisconsin). The incredible scenery, the string lights, the happy couple…..ahh, it was so romantic! Devin and I met online (Match.com) about 7 years ago! We met briefly to get a feel for each other and finally went on a first date a couple of weeks later. We have basically been inseparable ever since that date! Our first date was celebrating my birthday. I had a head cold but still agreed to the date. Devin took me to a little Mexican restaurant on Brady Street. We were sitting at a table right by the window. During dinner, we watched a guy park his car and very obviously gently back into the car behind him. He noticed us watching and proceeded to make it look like he was leaving a note for the other car, but never did. Devin also convinced me to have a spicy soup to help clear up my sinus infection during dinner, while also getting the waitress to sing me happy birthday with him. We then walked out on the pier in front of Discovery World and talked for another hour or two. It was such a magical first date. I really think our feelings of love began on that first night. What did you enjoy about working with Weddings With A Twist? Since Devin and I are in the wedding industry, we thought we had a great handle on everything as far as planning our own wedding would go. Little did we know, we were about to be in over our heads in planning! Krista helped us think of things we never would have otherwise thought of, such as garbages during the reception and if anyone was designated to clear the tables. I think this was probably the most surprising thing for us to encounter! Without the knowledge and help of Krista on our wedding day, we definitely would have had so much extra stress trying to do everything ourselves. She helped us take care of so much and truly allowed us to be even more present in our own wedding day. What was something unique you incorporated into your wedding day? Like all girls probably do, I had an idea of things I wanted at our wedding for years. Since Devin and I had been dating over 6 years before we got married, there was quite a lengthy Pinterest board of ideas at the beginning of our engagement! 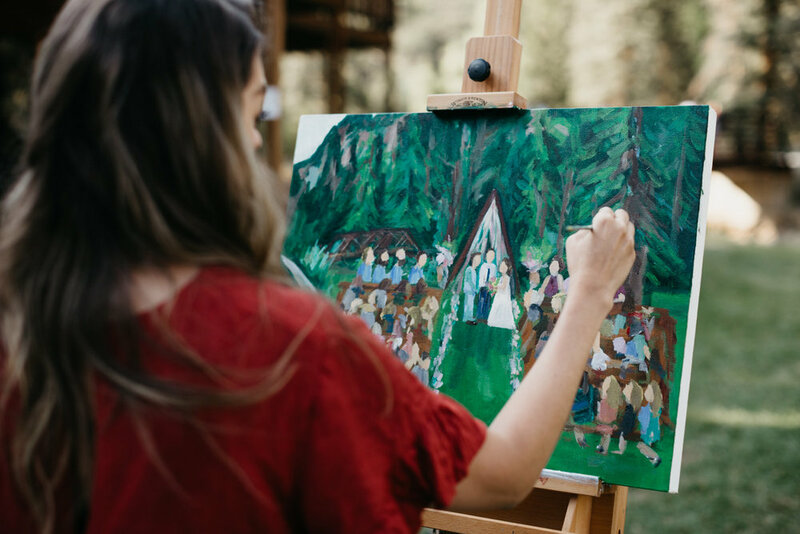 One thing that was incredibly important to me (especially since I was an art major) was having a live painter at our wedding. 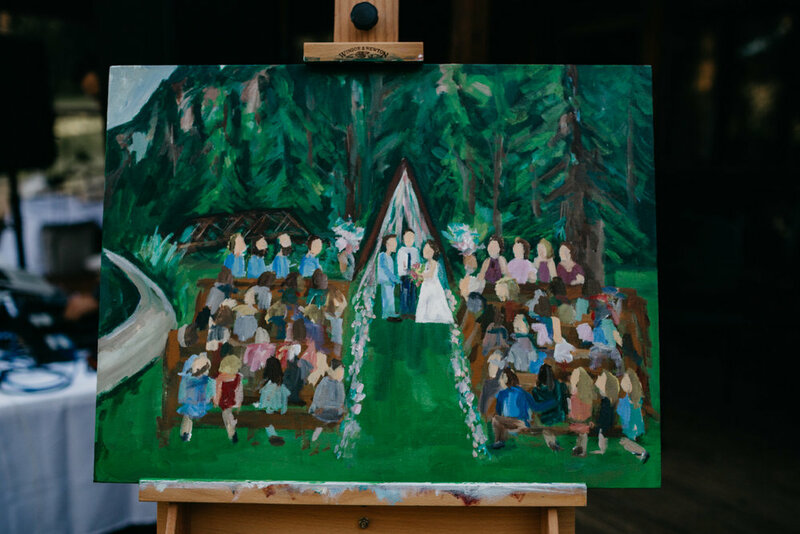 Devin wasn't 100% on board with this idea because of the extra cost, but once he saw the painting progressing, he was so happy that I pushed to have this be a part of our wedding. We loved having such a unique detail in our wedding and also seeing the reactions of some of our loved ones. It was so special for us! Which moment of your wedding was the most memorable? The most memorable part of our wedding was definitely our first look at sunrise in the mountains. We had originally been debating between eloping and having a regular wedding. After all of our considerations, we chose to have an intimate destination wedding. We still wanted to have a moment that was slowed down and completely intimate to the two of us. We chose to wake up at 3am on the morning of our wedding to get ready, head up into the Rocky Mountains, have our first look at 12,000 feet and read our vows to one another. It didn't feel real to us, but it was still so perfect. If there was anything that we would have done differently, it would have been to plan for even more time to soak in each and every moment. Going into our wedding day, we knew how quickly the few hours of commitment and celebration can go. Knowing this, we made it a point to plan in extra time for things and to not let ourselves feel stressed or rushed. I don't know that there was much more that we could have done to slow down our wedding day, but if there was, we would have absolutely done it! That day, being surrounded by our loved ones and celebrating the love that Devin and I have was the most special day to us. Having our photographs and films to remember the day will forever mean the world to us!